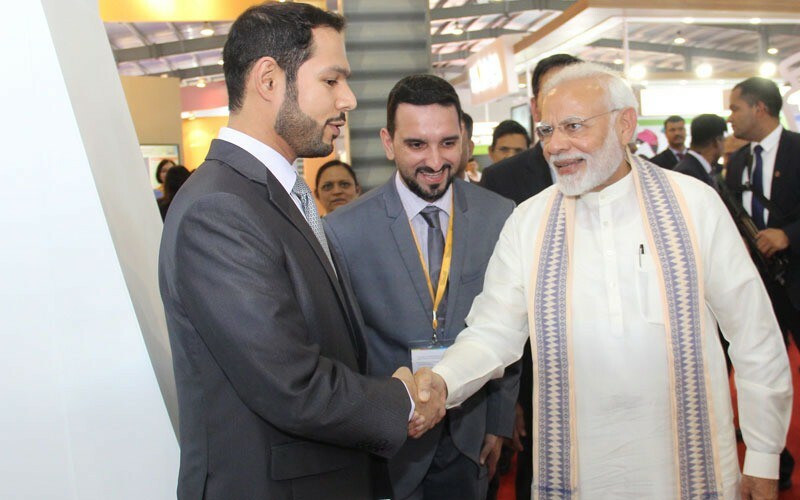 The Indian Prime Minister Narendra Modi visited today the Sultanate's pavilion at the Vibrant Gujarat Global Summit and Exhibition 2019, in Ahmedabad, India. During the visit, the Indian PM was briefed on the pavilion of the Sultanate, in which the Public Authority for Investment Promotion and Export Development (Ithraa) participates, along with the Special Economic Zone Authority of Duqm (SEZAD) and a number of companies operating in the Special Economic Zone of Duqm. The Sultanate is participating in Vibrant Gujarat Global Summit and Exhibition 2019 with an economic delegation led by Yahya bin Said al Jabri, Chairman of the Board of Directors of Ithraa, Chairman of Board of Director of SEZAD. The Indian Prime Minister opened today the exhibition, which enjoys wide international participation, and is held every two years. It is also one of the major investment exhibitions in the Republic of India.